Spin Palace casino is an online casino which makes use of Microgaming software to deliver a superior experience to online gamers. 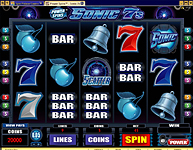 Having launched services in 2001, the online casino is now a highly reputable international brand. The casino is an ideal gambling spot for Australians who are welcome to sign on for free and are then offered an incredible 100% bonus on the first AU$1,000 they place. The rules limit the lowest deposit acceptable to AU$20. There are also some exciting rewards with players enjoying up to a hundred spins for free on the much loved video slot, Tomb Raider: Secret of the Sword. Loyal fans also love the Anniversary Bonus which is open to players who have been members for twelve months where they can enjoy another 100% bonus on deposits worth AU$105 or more. While Spin Palace Casino is an international brand welcoming players based outside Australia as well, there are specific exclusions to the rule with the terms and conditions ruling out opening of accounts or processing of bets for players based in Denmark, United States of America and Outlying Territories, Belgium, Italy, South Africa, North Korea, France and Outlying Territories, Israel, Iran, Spain and Turkey.